Walt Whitman (1819–1892).Song of the Universal. Leaves of Grass.1900. It was the season of falling autumn leaves. In a historic first, thousands of young Indians from every walk of life came together at the place where the Buddha attained enlightenment. 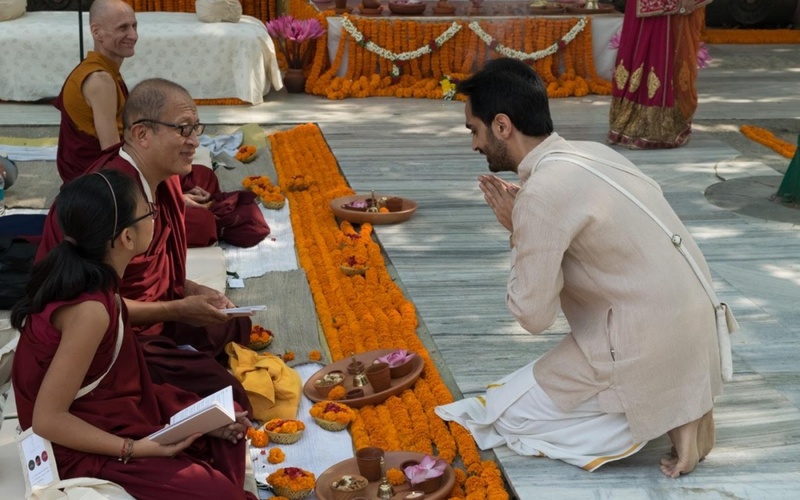 From November 11th to 13th this year, at Bodhgaya, in true Indian style and spirit, under the tree where Siddhartha became the Buddha, Indian Buddhist practitioners and students from various traditions assembled to pay homage to the Buddha. The seed that was Perfection bloomed under the Bodhi tree. The seed that was waiting blossomed two millennia later. The Buddha’s wisdom and teachings have spread all over the world and have been integrated into various cultures. His knowledge, informed by the wisdom and cultural traditions of the land around him has become an invaluable gift to the world. The extraordinary path the Buddha chose to walk, now lights the way for those who followed. The festival was organised by an array of diverse sanghas, voluntary organisations and corporate entities from across India. The dear ones from Deer Park, the noble ones from the Vana community, those drenched with the Dharma Rain, those with a firm Foundation in the Khyentse lineage, the senior beings from Antara, the gandharvas and apsaras of the Pune sangha were all there as they made the eight auspicious offerings to the Tathagata in the traditional Indian manner. This celebration was drawn from Indian wisdom and culture in a truly creative way, quite distinct from any religious gathering seen in the past. Through Indian dance, music, arts, discussions, dharma discourses, children’s sessions, community lunches, qawwali performances, was created a recognition of the tremendous spiritual, cultural and socio-economic potential of the Nalanda tradition. 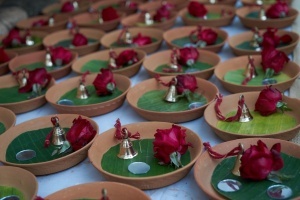 Each day saw a different mantle of flowers adorning the ground around the Bodhi tree, as if the heavens themselves had showered us with floral tributes: a carpet of golden marigolds on the first, a pathway of white tuberoses on the second, and it was roses, red roses all the way on the third day of the festival of Siddhartha. Dzongsar Khyentse Rinpoche was there and in a voice clear and pure, issuing in soft and gentle sounds, he extolled the virtues of the Buddha. This was the cue for the gandharvas and apsaras from Pune to guide the assembly led by Zubin Balsara into a group recital of devotional songs. Namrata Mahabal and Jaydeep Vaidya took the assembly to celestial heights with their own Hindi rendition of Shantideva’s dedication from the Bodhicaryavatara, ending with a soaring… “Manjugosh, manjushree, manjunath, manjugosh…” On that last high note many beings were seen having left their cushions, floating over the assembly, some with tears in their eyes. O Buddha, O Tathagata, O Mahamuni, Just as how you care, and how many you inspire.. How glorious and beautiful you are! May we also emulate and may we too actualize that “. And on the first day as the shadows lengthened at sunset, and the lamps were lit, apsaras led by Maneesha Abhay, choreographed the auspicious eight offerings, mesmerizing the gathering with their rhythms and Kathak dance moves. At the end of the first day, the entire assembly was transported effortlessly to the site of a great feast. And after the feast for the body, there was presented a feast for the mind and the heart. Qawwali, Langa music, and Dzongsar Khyentse Rinpoche’s latest film, “Hema! Hema!” And while we waited for that song in the bardo state, a brilliant performance of shadow puppetry by Vikramjeet Sinha. The second day dawned with morning meditation led by Venerable Dhammadipa, followed by the Dedication Chanting of 21 Taras led by Raji Ramanan. After an offering to the Four Stages of the Buddha’s Life was made, Professor Mahesh Deokar gave an illuminating talk on the place of Enlightenment, Bodh Gaya and the gathering were amazed to hear such wondrous things they barely knew before. More discussions over chai with Venerable Sumati, and a talk by Suresh Bauddha of the YBS on Buddha: India’s Pride, was followed by Venerable Sumati’s musings on the “Self-Forgetful, Imitative, Artificial” in Indian education, society and culture. Then followed group sessions of storytelling, stories of the contributions made by great Indians to the spread of the Buddha Dharma – from Emperor Ashoka to Kumarajiva, the translator from Kashmir. More vocal music by Vidya Rao segued into the dinner and post-dinner entertainment. The third morning began once more with meditation and the powerful Dedication Chanting of Samanthabhadra led by Deepa Thakur. Asha Pillai-Balsara gave a scintillating account of the story of the Bodhi tree, a story entwined with the history of Buddhism itself. And as she came to the part describing the agonizing dilemma of King Ashoka wanting to cut a part of the tree, without hurting the tree, the Bodhi Tree over Asha’s head very kindly dropped an overhanging branch at the feet of our gurus sitting in front. The beings in the great assembly smiled and bowed their heads, marvelling at this auspicious omen. And in response to this gift from the universe, Annabelle von Arnim made her offering of two operatic arias, in a homage to Mother Nature. After more gratitude was expressed to all beings and to the Buddhas of all directions, for this opportunity to celebrate this mighty son of Jambudvipa, this great assembly dispersed with promises to meet again.